Tasmania is an island typified by great scenery, walks, beaches, food and drink. It is also home to some of the most weird and wonderful of Australian wildlife. 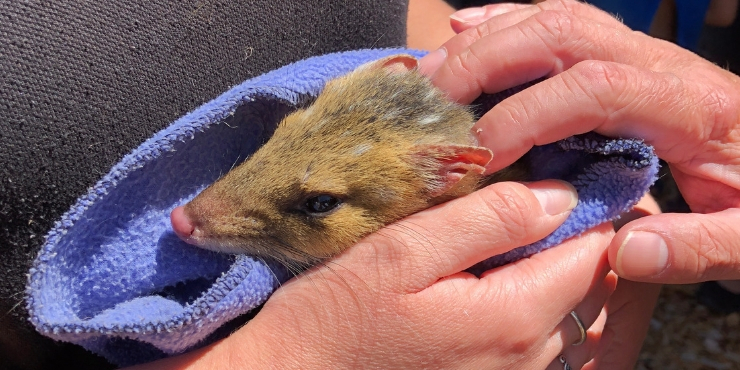 Many Australian animals at risk on the mainland have survived and thrived in Tasmania and you will inevitably come across some of the island’s inhabitants on your travels. 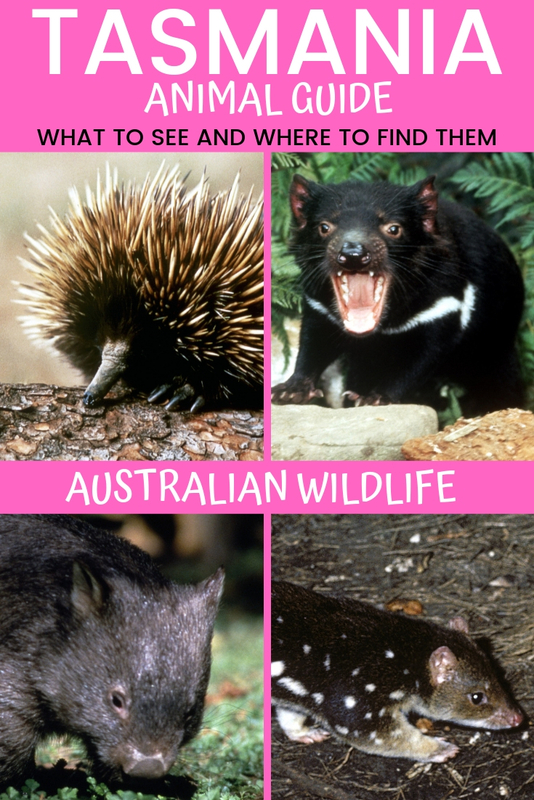 In this detailed Tasmania animal guide you will find information about each of the animals to see as well as where to find them on your Tasmanian adventure! 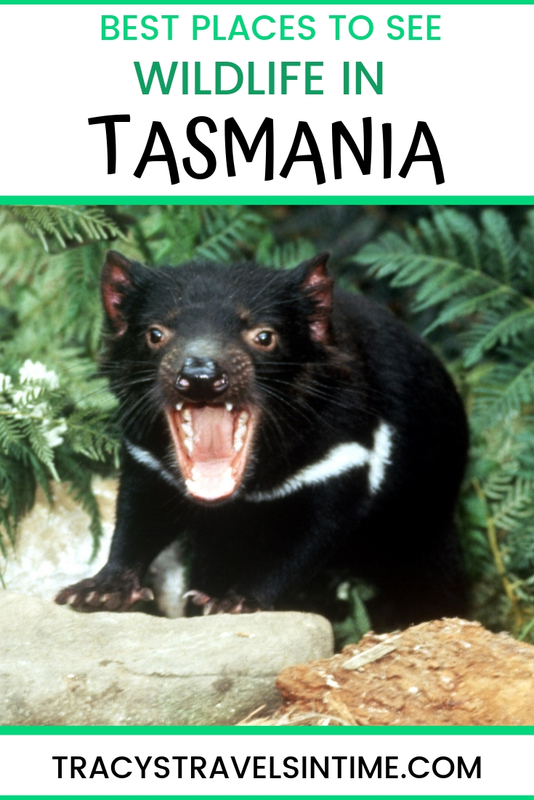 Although once found on mainland Australia wild Tasmanian Devils can only be found living in Tasmania. Carnivorous marsupials about the size of a small dog they have a temper that matches their name! Unfortunately over the last 20 years 70% of devils in Tasmania have died due to the spread of a cancerous facial tumour. They are now classed as an endangered species. Whilst research into finding a cure for the disease continues insurance colonies of disease free Devils have been created to prevent their extinction. Tasmanian Devils have an incredibly powerful bite and they can eat bones, fur and flesh with ease. Apparently biting through bone for them is the same as humans biting through cheese! They are also quite aggressive animals and will squabble and fight with each other which is also contributing to the spread of the disease. Tasmanian Devils are nocturnal and shy so actually seeing one in the wild may be very difficult during your trip. Unfortunately the only wild devil we saw had been the victim of a road traffic accident. Luckily you can visit one of the many sanctuaries and zoos on the island to guarantee seeing them. 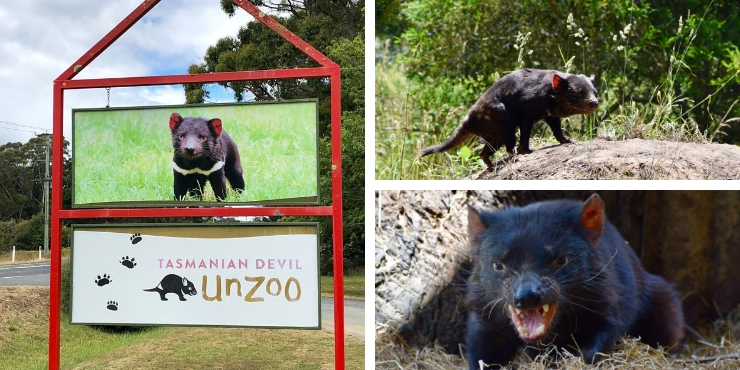 Located in the Tasman Peninsula, which is home to a wild Tasmanian devil population free from the deadly disease sweeping the rest of the island, the Unzoo is the world’s first zoo without outer fences and boundaries. Local wildlife is free to come and go as it pleases so expect to see pademelons and other wildlife wandering round with you! INSIDER TIP – Don’t miss feeding time for the devils! Seeing the animals bite through bones with ease is quite an experience. 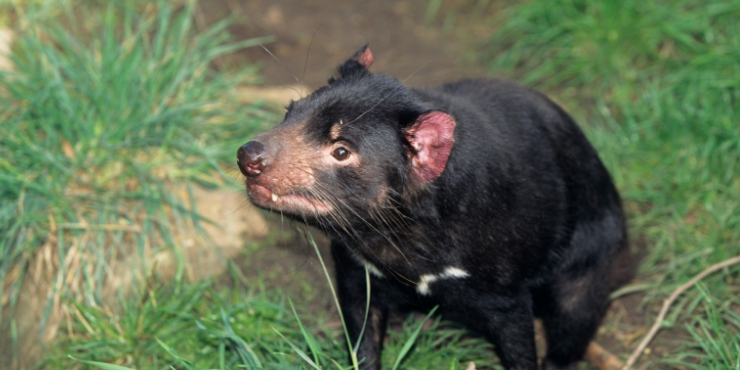 If you would like to learn more about Tasmanian Devils join a Devil Tracker Tour where you will experience a fully-guided four-wheel drive tour to see first hand how their numbers are being tracked and monitored. If you are at Cradle Mountain a visit to Devils @ Cradle should be on your itinerary. Devoted to breeding and conservation of Tasmanian Devils, Eastern Quolls and Spotted Tailed Quolls this is an excellent place to learn all about these animals. We recommend joining the new Joey Encounter to meet some of the younger animals at the sanctuary. This tour gives you exclusive access to the hand-rearing nursery and the chance to interactive with some of the captive-born joeys. INSIDER TIP – The joey encounter is only available during the summer months but there are some other excellent tours available including the “After dark feeding tour” and a “Dine with the devil tour.” More information is available on the website. There are 3 different types of wombat found in Australia – the common wombat and the eastern and southern hairy nosed wombats. 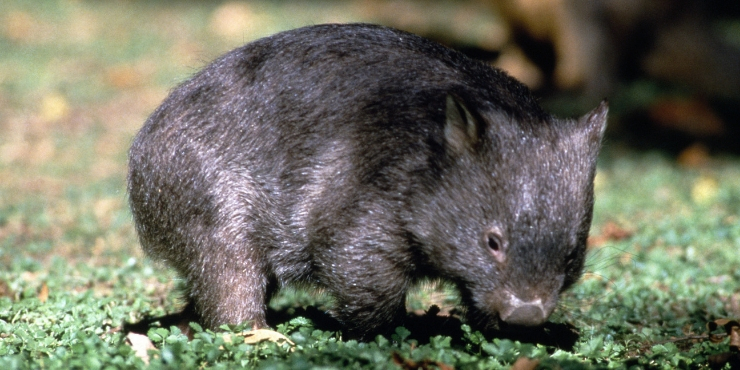 The common wombat has 3 sub-species of which one species inhabits Tasmania. The wombat is the largest burrowing mammal in the world and also (like many other Australian animals) has a pouch. They are mainly nocturnal and emerge at dusk to eat. They are found all over Tasmania with larger numbers in the north-east of the state. Wombats live for about 5 years in the wild and are infamous for producing square shaped poo! They are also incredibly cute! Head into Cradle Mountain Park (take the bus from the visitor’s centre) and alight at Ronny Creek. Take a walk along the boardwalks at dusk and enjoy the sight of wombats emerging from their burrows and foraging around the park. They often come very close to the boardwalks so have your camera handy! Maria Island is home to many of the main island’s species after they were released there in the 1970’s to protect them from extinction. 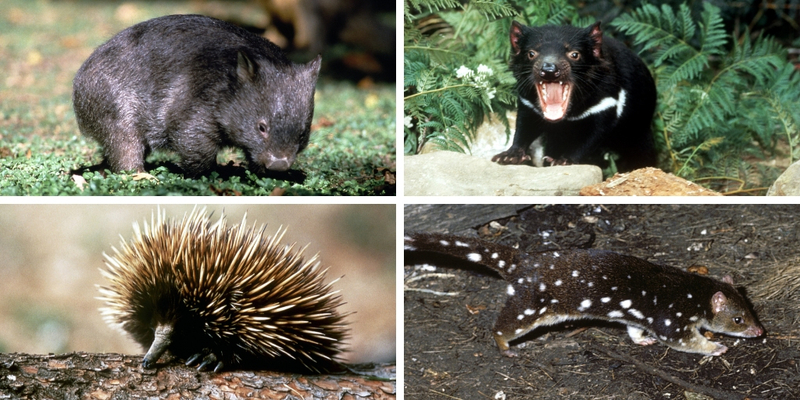 As well as wombats you will find Tasmanian Devils, wallabies and kangaroos inhabiting the island. The entire island is a National Park. INSIDER TIPS – Take the ferry from Triabunna. The crossing takes 30 minutes. Accommodation is available on the island (no shops though!) and there are some campsites if you want to spend some time there. The Tasmanian Pademelon is the only species of pademelon found on Tasmania. Pademelon’s are short and stocky in appearance. The name pademelon is derived from the Aboriginal word for the animal. You will find them in abundance all over Tasmania and they are only protected in the parks and reserves. They are solitary animals preferring to come out from the thick vegetation they sleep under in the day to feed at night. 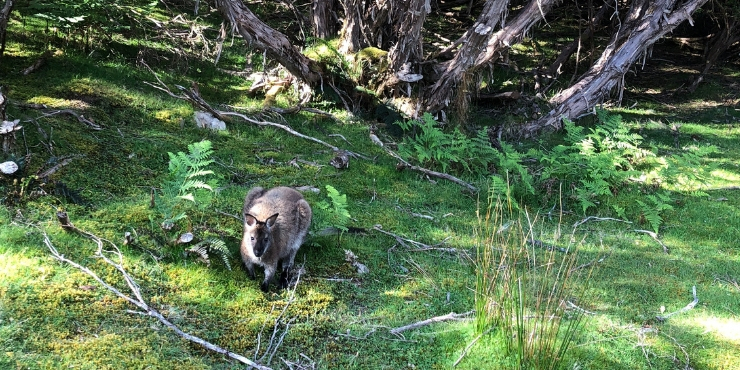 INSIDER TIP – Our favourite pademelon encounter was in Freycinet National Park when we stayed at the Edge of the Bay resort. You may find that whilst enjoying breakfast on your deck a few pademelons may come to see what you have to eat! Obviously we didn’t feed them but it was a wonderful experience! Quolls, like Tasmanian Devils, are hard to spot in the wild as they are shy, nocturnal animals. They have been identified as threatened species on mainland Australia with the Eastern Quoll considered all but extinct. They are carnivorous marsupials and carry their young in a pouch. If you want to see spotted-tailed quolls the best area is at Cradle Mountain. Eastern quolls can be seen at Mt Field National Park. The best time to see them is after dark. As previously mentioned above for the Tasmanian Devil one of the best places to see quolls in Tasmania is the Devils @ Cradle sanctuary on Cradle Mountain. INSIDER TIP – If you are staying at Peppers Cradle Mountain Resort join them on their evening tour of the park at dusk as this is the best time to spot the animals. Alternatively take the joey encounter at Devils @ Cradle to see some of the young quolls which have been bred at the centre. 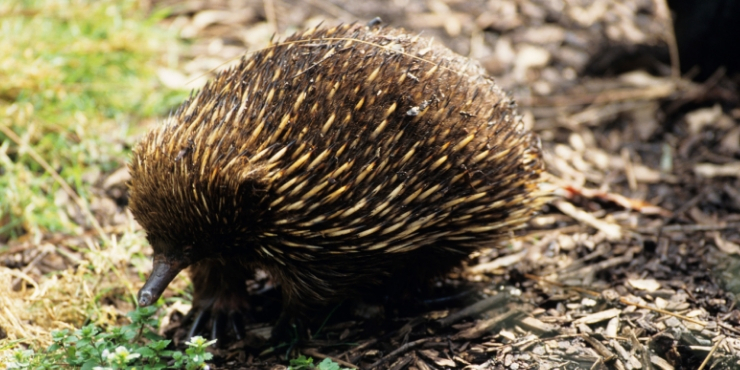 Echidna are Australia’s most widespread native mammal and can be found all over Tasmania. Short-beaked echidna (the species found in Australia) are pretty hardy and live in all sorts of climates. They are (along with platypus) monotremes. Monotremes are the only type of mammals that lay eggs rather than giving birth to live young. Living off a diet of ants and termites the echidna live for up to 14/16 years in the wild. We spotted echidna a few times in Tasmania – mainly along the sides of the road – so keep an eye out as you are driving. INSIDER TIPS – Be careful if you see echidna in the road as often cars are low enough to clip them and hurt or kill them. If it is safe to do so try to drive around the echidna. Along with the echidna platypus are also monotremes. 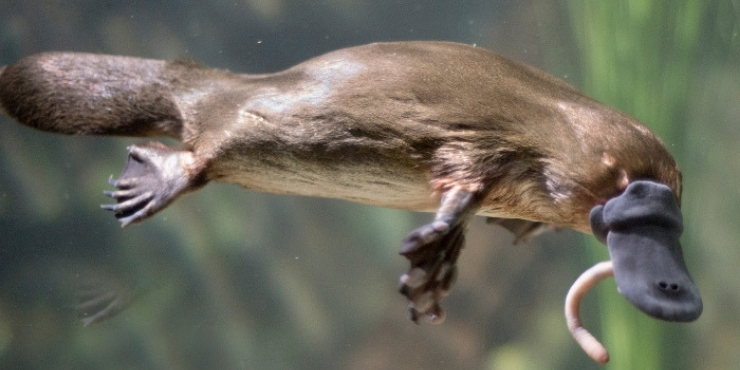 Platypus can be found in Queensland, New South Wales, South Australia and Victoria on the mainland as well as in several locations in Tasmania. This weird looking creature was declared a hoax when the first specimen was taken back to Europe with sceptics claiming the stuffed animal was a mixture of various creatures sewn together. Platypus can be quite difficult to spot and you will need both luck and patience to see them in the wild. I have been lucky to have seen a few in Eungella National Park near Mackay in Queensland so spotting the elusive creature in Tasmania was high on our Tasmanian wildlife to see list! Geeveston Circuit Platypus Walk. There is a resident platypus family living right in the town and if you follow the platypus walk you may have an encounter with the elusive creature! Just remember to be as quiet as possible. Warrawee Forest Reserve and Bell’s Creek. In the lake near Peppers Lodge. Again I will highly recommend a stay at Peppers Cradle Mountain as the wildlife around the lodge is fantastic. INSIDER TIP – Platypus seem to like caravan parks! No but seriously the best time to see platypus is at dusk and dawn. Look for the tell-tale trail of bubbles rising to the surface, keep very still, as quiet as possible and hopefully a little head will pop up! Coming soon – A guide to visiting Cradle Mountain, a packing list for Tasmania, a review of the Tasmanian Devil Unzoo, a guide to visiting Port Arthur and a review of the joey experience at Devils@Cradle. That’s really informative! I had never heard of a quoll or a pademelon!